Sometimes, it is easy to get caught up in what a film might have been, instead of appreciating it (or otherwise) for what it is. The stunning first act of The Messenger sets the bar so high that the later sequences really disappoint. Ben Foster is Staff Sergeant Will Montgomery, recently returned from war after being injured by an IED and left with eye problems and a slowly healing leg injury. He is thought to be a hero but feels otherwise, and he just wants to get through his last three months of duty before being discharged. 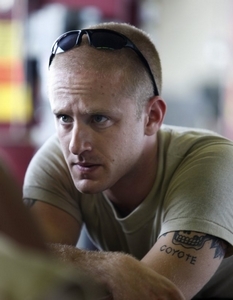 When he is assigned to the unit responsible for informing nexts-of-kin that their loved one has been killed in action, he will confront his own demons and those of his superior officer, Captain Tony Stone (Woody Harrelson). Foster stole the limelight from more fancied co-stars in 3:10 to Yuma, and in The Messenger he is simply wonderful. Montgomery is haunted by his actions on the battlefield, never able to accept that one can control only what one can control, and that most people applaud him for the decisions he made despite their negative consequences. He is in love, but can’t bring himself to admit it, and lost without a sense of how to move forward. Foster conveys all this and more in a facial tick, or a look that could break hearts the world over. Above all else he is required to be taciturn, and were it not for his great talent there is no way his character could be so successfully conveyed. Harrelson manages to keep up with his younger colleague in scenes that might really stretch the audience’s understanding of what he is capable of on screen. In some ways, Stone represents the future Montgomery faces, and Harrelson proves himself just as capable of portraying a broken-down man. Unfortunately, the film’s second half takes its audience down a well-worn path of alcohol, fighting, mistakes and regret, and although the plot develops as a consequence of its characters and their actions, the fact that we all have seen much of this so many times before is ultimately disappointing. When compared with the brave and challenging first half of the film that requires its audience to wallow in the misery of death and destruction, one can’t help but feel let down. This entry was posted in Film Reviews and tagged Drama, War by Mark Lavercombe. Bookmark the permalink.